Q. What is Natural Hydraulic Lime (NHL)? Natural Hydraulic Lime (NHL) is made from limestone that contains impurities such as clay and silicates. There are three European classifications for NHLs and those are NHL 2, NHL3.5 and NHL5, the grading is determined by the compressive strength of its mortar after 28 days. Historically NHLs were called Feeble (NHL2), Moderate (NHL3.5) and Eminently (NHL5), but the use of these terms are declining with the introduction of the European classifications. Q. What insulation can be used? We offer a Light Expanded insulating Clay Aggregate, it is made up of lightweight granules formed by expanding clay at high temperatures, it is widely used in horticulture and with cement for flooring. We use the clay as the main insulating loose lay sub layer and a lightweight aggregate for limecrete floors, in this application the clay is coated with soap is laid underneath the slab as a loosefill insulation and uncoated aggregate is mixed with NHL to create the floor slab. We also offer a recycled foam glass aggregate Technopor. This is compressed and provides a better thermal performance and a more solid base. Q. What is a Geotextile Membrane? The geotextile membrane is designed to allow moisture to move through it but it stops any larger particles or vegetation. In the Limecrete application the membrane is used to seperate the loosefill layer from the ground and then from the slab above. Q. What are the average thicknesses of the layers? The binder that we recommend is NHL5, it sets by an initial chemical reaction called a hydraulic set, this process gives the slab & screed their early strength. The NHL then continues to carbonate over a longer period of time to reach its final compressive strength. The temperature and humidity of the environment will affect both types of set, either by increasing or decreasing the setting process, in perfect conditions the slab will harden sufficiently to allow light movement across it within 3 days. We suggest that the screed is laid when the slab is still green hard, so that the screed and slab bonds together to form a stronger floor. Q. Can you install underfloor heating in a limecrete floor? You can install underfloor heating when using limecrete, normally the pipes are tied to a geogrid mesh or fixed via a clip rail to the slab. Do not use a plastic sheet system that you clip the pipes into that can seal the floor like a DPM does. Please note that it is important not to create a barrier to the breathablility of the floor. Once the pipes have been fixed to the slab then you can lay a screed of NHL5 and sand over and around them, this is usually around approx 75mm deep. 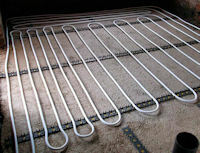 Please note that you cannot use the underfloor heating for a minimum of 4 weeks after laying the screed. Q. What can you finish the limecrete floor with? The most important factor in the finish of the floor is the breathability of the materials laid onto it, if you go to the effort and expense of laying a limecrete floor you want it to work properly and not fall at the last hurdle by sealing it with an impervious layer. The standard finish to the floors are flagstone or natural tiles, they are not usually sealed with anything, but can be treated with an oil to make them more dirt resistant. If you did want to use an impervious tile, e.g. slate or ceramic, you can get partial breathability by making the joints between them at least 10mm wide. And finally carpet… we regularly get asked if carpet can be laid on limecrete, and the answer is that we don’t advise it, unfortunately the underlay and vinyl backing of the carpet effectively seals the floor. In addition any moisture that rises through the floor will get absorbed into the carpet causing damp.